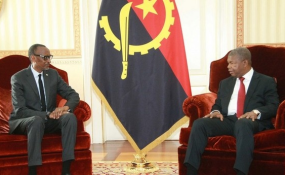 Luanda, 20 March 2019 - President Kagame started on Tuesday a two-day working visit to Luanda, Angola where he met with his counterpart President João Lourenço. On the first day of the visit, the two heads of state held a tête-à-tête meeting followed by a luncheon hosted in honour of President Kagame. On the second day of the working visit, the Heads of State are scheduled to address the press. The visit serves as an opportunity to strengthen bilateral cooperation between the two countries and existing areas of partnerships including air transport, security and justice, migration, ICT and governance. Rwanda and Angola enjoy excellent bilateral relations. Rwanda is represented to Angola by its Embassy in Luanda, while Angola's Embassy in Kigali was established since February 2019. Copyright © 2019 Government of Rwanda. All rights reserved. Distributed by AllAfrica Global Media (allAfrica.com). To contact the copyright holder directly for corrections — or for permission to republish or make other authorized use of this material, click here.